They have performed worldwide with outstanding success and have been featured on over 25 TV shows throughout the UK & Europe, and April 2000 saw them featured on the ITV programs 'The Yeung Ones' and the documentary 'Stars and Their Lives'. The year 2001 has seen them off to a flying start with an appearance on the famous Late Late TV Show in Dublin, Ireland. 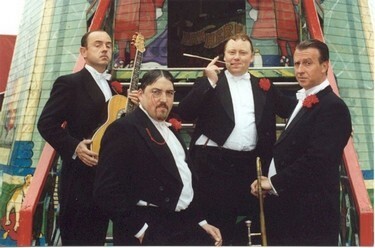 Due to their astounding success on the show they have been invited back as special guests on 'A Song For Ireland' for a 15 minute LIVE TV performance on the 25 February 2001. Wootten Basset - Trombone, Vocals and eyebrows. Following a narrow escape on the Titanic where he was working as a scullery maid, Wootton vowed to give up his former profession ( though not the silk stockings ) and formed the band. Clark Deville - Guitar, Vocals and Psychiatric counselling. He's got rhythm. And music. And my gal too. Who could ask for anything more ? Well, just in case you could, he's also got several small islands in the Pacific. Baron von Schneider II - Piano & Vocals & Monocle. (Hair by Toni.) Frustrated soprano and former diet Coke addict, the chunky World War I flying ace joined the band because of his love of dangerous situations. Perhaps his war experiences explain his mad behaviour. And perhaps they don't. Pico Boon III - Double Bass and Top Hat. Pico has had a distinguished career as a top War correspondent, celebrity chef and billiard player. Following the recent creation of the N.S.P.C.C. , Pico will only briefly be utilising his unique vocal 'talents' for you.